RBTH presents a selection of views from leading Russian media, featuring debate sparked by the deaths of two Russian state TV reporters killed near Lugansk and news of Kiev’s reaction, as well as news that Ukraine is considering the construction of fortified border fences and trenches along the frontier with Russia. The Kommersant daily reports on the deaths of two state television journalists near Lugansk in eastern Ukraine. 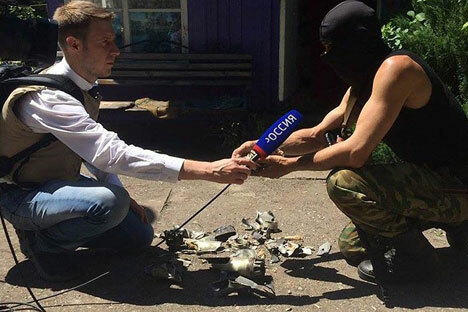 The publication reports that television correspondent Igor Kornelyuk and video engineer Anton Voloshin, who were filming the evacuation of residents from areas under mortar attack at a roadblock set up by a militia, died from injuries sustained during the attack. At the time of the tragedy, the crew was preparing a story for the evening news about whether there was an official humanitarian corridor in place and whether the peace plan Ukrainian President Petro Poroshenko had proposed to resolve the situation in the south-east of Ukraine is actually being implemented. In addition, the publication cites words quoted from the official statement of the Ministry of Foreign Affairs of Russia, which demand that Kiev conduct an objective investigation into the death of Russian journalists and severely punish the perpetrators. The article on the same topic in Vzglyad reports that the news of the death of Russian journalists “provoked a reaction at the highest possible level”: The UN Security Council adopted a presidential statement, which called for an investigation into the deaths of state television employees. In addition, as noted in Vzglyad, Kiev has already hastened to hold Lugansk militias (“terrorists”) indirectly, if not directly responsible for the deaths of the two Russian journalists killed in Lugansk. The newspaper writes that while Poroshenko expressed his condolences to the families of Igor Kornelyuk and Anton Voloshin, promising an investigation, the Security Service of Ukraine managed to accuse Kornelyuk of not having received permission to work in Ukraine. The publication notes that, according to the law, such a document was not required. "In Kiev, people seem to have forgotten that since 2011 permission is not required for Russian journalists,” emphasized Vzglyad. Nezavisimaya Gazeta reported to its readers that Ukraine may close the borders with Russia before the week is out and impose a state of martial law in the Donetsk and Lugansk regions. According to the publication, Kiev is considering a temporary ceasefire. Nezavisimaya Gazeta reports that a truce may be declared in order to enable the Russian volunteers to lay down their arms and return to their homeland, and for civilians in eastern Ukraine to leave the combat zone. The publication notes that militias which refuse to surrender “will be treated and dealt with by the Ukrainian government as terrorists.” In addition, the newspaper reports, there is a project on the table involving the construction of a solid metal fence with electrified barbed wire on the border with Russia. The area adjacent to the fence may be laced with mines, and they plan to dig a deep trench in its approaches, notes Nezavisimaya Gazeta. According to the newspaper, the final decision on this matter is still pending, but soon the Ukrainian side plans to strengthen border security by increasing the number of soldiers with modern weapons and other technical means. Nezavisimaya Gazeta also writes that demands have been renewed for early elections among the Ukrainian population: “A vote must be passed by a proportional system based on open party lists.” It is also assumed that the Verkhovna Rada will soon consider drafting new election laws and familiarizing themselves with the new Constitution. According to the newspaper, Ukraine still faces a big question: It must decide “how will develop its relations with Russia – as a scripted cold peace or cold war."